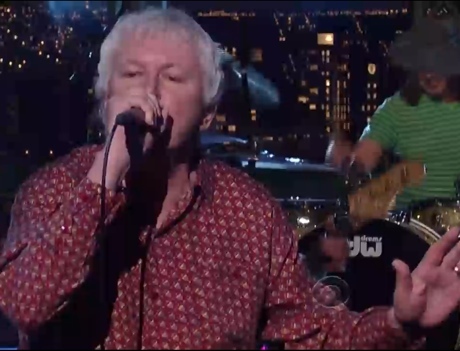 Recently reunited iconic indie rockers Guided By Voices made an appearance last night (January 3) on The Late Show With David Letterman. They took to the stage to run through "The Unsinkable Fats Domino" from the Ohio band's upcoming record Let's Go Eat the Factory. An entertaining performance in more ways than one, check out bass player Greg Demos take a tumble before the song even reaches the one-minute mark. Nevertheless, the band happily played on and laughed about it afterwards. Let's Go Eat the Factory is currently available digitally and will hit stores January 17 via the band's own GBV Inc.